1) H frame verses C frame; what are the differences? 2) How big of ram is required (max and min)? 3) What are the advantages and disadvantages of having the ram mounted on the top, pressing down, or bottom, pressing up? 4) I would ask about single verse dual stage pumps, but I already got myself a sweet setup. But it might be good resource for anyone else. 5) How much stroke is required -- easy guys! What is the minumuim and maxuims? 6) Pump requirements. I have a Parker what outputs 15 gal per min already setup with external filter, hoses and tank. I'm not an expert here but I got it from a company that had it as a spare which went bankrupt. Please add anything else that I may have missed. "H" frame is without a doubt the stronger of the two designs, just by virtue of the design, it will have less flex. "C" frame presses require more mass (heavier structural material) in order to eliminate as much flex as possible. That's about the only drawback I have found to a "C" frame press. I personally think that 6" is the minimum that should be used for a forging press. These are sometimes difficult to find, and are expensive. What you have to realize with hydraulics is that the smaller the diameter of the ram, the more pump/line pressure is required to achieve a given amount of tonnage (force). My press has an adjustable "bypass valve" which means I can control the amount of pressure in the system. It scares the crap outta me when I'm in a shop with a forging press that has a 4 or 5" cylinder, and it's being run with pressures in excess of 3,000 psi.....most hydraulic lines are only rated for 3,000psi, and if I line were to develop even a pin hole at that pressure, it would cut you in half like a laser! I keep my press set to bypass once the pressure reaches 2,000psi....which gives me right at 25 tons. The only advantage I can think of for either is for a top mounted cylinder....it keeps all the vital parts out of harms way. With a bottom mounted cylinder, I would highly encourage shields/guards over all the vital parts such as hoses and connections....repeated contact with forging scale/slag, or inadvertently whacking a hose with a hot bar of steel is likely to meet with very bad results. My pump is a single stage, but it's really all about what you get used to.....after having used a single stage for so long, I find it difficult to work accurately on a 2-stage unit. What I don't like about the two stage pumps is that momentary "surge" of power when the second stage kicks in, and the slow down in ram travel, which is usually 1/2 of the 1st stage speed. It's all going to depend on how much room you think your going to need. My press has 8" of travel, and for some things it's not enough....I can't use drifts, punches, or hot cuts in the press because there is never enough room. I've often thought that I would like to have a second press in the shop with about 14-16" of travel for making "loaves" of damascus or operations where a drift, punch, or hot cut is needed.....maybe someday. It's all about matching components to achieve the tonnage and ram speed that you desire. For example, my press runs a 6" dia. cylinder, 8" stroke, 11.5 GPM single stage pump, powered by a 5hp, 3450rpm motor. This yields 1" of ram travel per second, and when the bypass is adjusted for bleed off at 2,000psi, 25 tons of force. SAFETY! : If you've not worked on a press, you MUST understand that there are incredible forces at work....you MUST keep work pieces under the "center of force" (right under the ram)......for example, if you have longer dies and try to work towards one end or the other, your either going to break the press, shoot something either through yourself or the shop wall, or just cause yourself a lot of pain and/or heartache. Personally, I don't think there can be such a thing as an "Over built" forging press. Don't try to be the type who thinks they can calculate out the size/gauge/thickness of the press frame materials and get away with building it as light and cheap as possible.....your only looking for trouble. Over Build the frame/super structure just as much as you can, and don't spare the gussets or welding rod! Finally, use the right components for the jobs.....don't try to skimp on a given part to save money.....otherwise I might be taking ABOUT you (as in "I knew this fella once...)....instead of TO you. If you weren't familiar with it, the ABS has a manual by Doc Batson that's very helpful with matching and predicting component performance, as well as structural strength. On the other hand, thanks Ed for taking it beyond the book! I second Ed 100% I would like to add that on what ever cylinder you get you also want to get a cylinder with a 3" ram anything smaller will just cause you grief. My press is a totally different animal and is not relevant to your build but thought I would mention what it is as I had a problem caused by the previous owner that could have hurt me seriously or killed me, it is a commercially made press that is 26 tons. It is a C frame and has 4" cylinder, I don't have the GPM info but it is a single stage and the ram does move about 1" per second and it runs at 10,000 psi. The scary thing is the guy I bought it from had to replace a hose and used a 3000 psi hose. The very first time I went and used the press the hose failed and when I went to the Power Team dealer I was informed someone put the wrong hose on it. SO make sure your hoses are rated for the working PSI of the press. After this I got with the rep and we did a safety check to ensure there was no more inadequate equipment on the press. I have the same problem as Ed with I do not have room to use tools like drifts, cutters or the likes. I do have an advantage that my cylinder height is adjustable and right now it is in the middle position so I could move it up but would have to rearrange the hoses and raise my reservoir, but rather think I will make a new press with a longer stroke in the 12" - 14" range. I do like the C frame configuration so will stay with that. Like Ed said don't SKIMP this thing could seriously injure or kill you. They have so much power it is truly unreal so use great caution. hi guys,i fully agree with what you said and looks to me that you covered everything.what i would like to know is there a site,or sites where i can get the hydraulic pumps, tanks, hoses,well all the stuff i need to build a press?i have the steel,i just need the rest of the stuff and someone two ask questions about any troubles that mite come up! If your looking for something like a "kit" that contains all the hydraulic components, I don't think there is such a thing. To my knowledge, you'll have to "piece" things together from different sources. The first step is learning exactly what specific "pieces" you need to achieve your end goals. After that, it's finding the sources for those "pieces". While everybody wants to build their own forging presses, thinking it's more economical, in many cases if your not knowledgeable of hydraulics and the components, it winds up being cheaper and MUCH safer to purchase a ready made press from the sources that are available. Thinking about it, most presses that I have built have required 4-5 different vendors, and a LOT of research. When you factor in all the time you spend chasing down vendors, parts, and the time spent assembling everything, the money you'd spend on a ready made press starts looking pretty reasonable. thanks ED,i need everything and have a hard time getting info from vendors around here,they want to either build it or sale you one! (VERY TIGHT LIPPED)i know a little about it and could probably build it,but like you said it would be safer to buy one.thanks again. I have all the material but the ram. WOW, they are expensive! Anyone know where to source a ram in the USA, as it would be interesting to get a couple prices. In Canada, the prices I get are exceeding $1000.00. I was hoping to find a good used one somewhere. I appears they have strokes from 8" up to 60" in stock....the 8" stroke is selling for $569.95. Big bore cylinders are not cheap! Once you get past 5" bores, the price goes way up. This is why I mentioned previously that when you start looking at the actual prices of components, those "ready made" presses don't look so bad. A bunch of great advice here so far on a press. I will say this about the "H" press, or presses in general - I have seen so many people over-build them from the bottom die on down to the floor. These are NOT power hammers - they need no extra mass to absorb shock, only enough to resist the stress of the cylinder with good welding. I say this in reference to Ed's mention about the larger foot print of the "H" press, and taking up more space in the shop. You can use that to your advantage! Then, you can roll it out of the way whenever you like. This frame and "anvil" area are over 3/8" high strength 4X6 tubing and is so strong it's hard to describe. 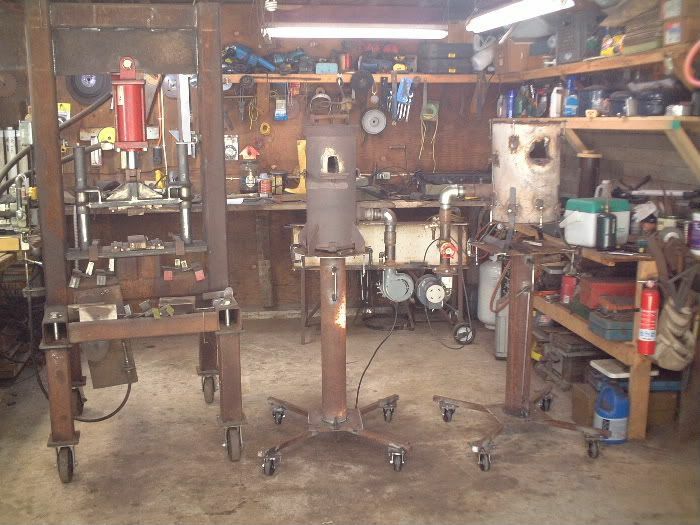 We just welded on 1/4 tubing out the four directions to put legs and wheels on it. Another advantage to the "H" press is that more of the energy is directed into the work piece and less is diverted into frame flex. What do you do when you see your ex in pain, limping and bleeding? Relax. Take a deep breath. Reload and then shoot again. Visit Karl B. Andersen's homepage! Good point Karl! Come to think of it, I've seen the same thing...the bottom end of the press (below the bottom die) built like a brick outhouse.....and not much on the business end. All the bottom needs to do is support the top (if the cylinder is top mounted). Just goes to show you how many people simply do not grasp the forces they are dealing with in a press. I will have to say that I'm a bit disappointed with your press..... I expected to see a Candy Apple red paint job with pin stripes! And what about "mag" wheels?? Your slack'in on me Pal! LOL! Dennis, presses don?t have to be physically big and take up a big footprint. This press is about 4 ? ft tall and 16 inches wide. The 6-inch bore, 3 inch rod, 10 inch stroke cylinder is mounted on the bottom. There is a piece of high temperature silicon rubber that protects the cylinder rod from any scale getting either on it or near the rod seals. If you are concerned about scale landing on the hoses there are hose protectors made from Kevlar that are used in high temperature applications in steel mills that will slide over any exposed hoses. There is ZERO movement on the press from any side loading. The rod is shimed in place by the die block and the cylinder has cross supports on the head end to prevent any movement. The relief valve on this system is set at 3200 psi and on a 6-inch bore cylinder that equals 90,432 pound of force, 45 tons. My only complaint was that when I designed the press and made the cylinder I had figured that 10 inches of stroke would be enough. So I took the cylinder tube and cut about 9 inches off. As you can see from the picture there is lots of room for the extra length and it would not have made the press any larger. Last edited by Cal Ganshorn; 11-23-2010 at 10:15 AM. Your just the person we need in this discussion! Hey everyone....if you have questions, I'd bet Cal can offer many of the answers! I have one really important comment for Cal.....I want your ram! Call me if you have another. Dennis do you think these will work 7 inch bore, 5 inch rod and an 14 inch stroke? Mounting is a flat plate on the bottom with 4 holes in the plate. Let me see what I can do and see if they are any good inside. There is no extra charge for the snow. Last edited by Cal Ganshorn; 11-24-2010 at 08:22 AM.